Priya's Menu - Yum Yum Yummy food for Food lovers ! : Eastern Products Review 2 ! My kitchen shelf reserves a special place, when it comes to my favorite Eastern masala products, as I am using it for a quite long years and all credits to my neighbor, who introduced this masala to me, during my stay in cochin. 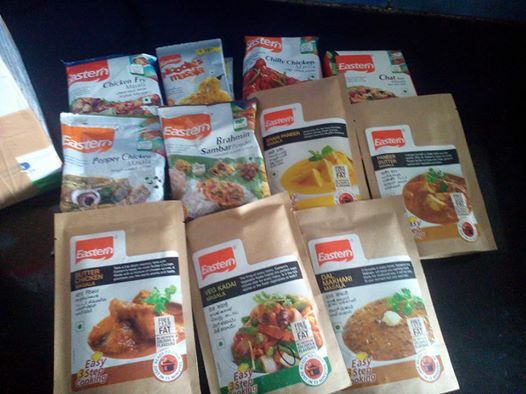 And the first recipe which I have tried using Eastern masala is a chicken masala which made me to buy their ranges of products and satisfied too. A year ago, I got a lovely chance from Eastern condiments to review their Karnataka special products "Bisbele bhath", "Vangi bhath" and "Puliogare". Click HERE to know more about those products. I chose Paneer based products "Shahi Paneer masala" and " Paneer butter masala" , as it was so inviting, interesting and my family's favorite too. The cooking procedure and required items for the recipe made me really wonder. All you need is Milk, Paneer and Tomatoes along with this masala powder to prepare this yummy north Indian dishes. Amazing right! Ok, let me start with the first recipe... Shahi paneer masala ! Shahi paneer masala is a very famous North Indian dish, which is originated from the Mughal kitchens. "Shahi" is term for Royal and likewise, the recipe also tastes rich and royal, as it contains cream, almonds and spices. The process of making Shahi paneer masala is also a time consuming, but the flavor and taste will rid of all the pain of the cooking process. And when the same masala can be prepared using just 4 ingredients, I feel it's a gift for bachelors and working ladies. I followed the same procedure as given in the pack and it took 20-30 minutes to complete the gravy. The color looked the same way, as we get in Restaurants. The gravy was creamy too, as it contains milk powder. Personally, I felt the flavor of Turmeric powder was a bit dominating the taste, but no compromise in the texture and aroma. According to our taste bud, salt was insufficient, so added little amount of salt to balance the taste. Served this delicious creamy masala with Roti, but can also be served with Pulao. My Rating - 3 1/2 on 5 ! The dish was palatable and flavorsome except for the mild dominance of Turmeric taste. Paneer Butter masala is a creamy dish which is cooked in Tomato puree and a generous amount of butter. This is one of the famous dishes in Restaurants, when one prefers for the North Indian side dish. Like Shahi masala, this masala also requires the same quantity of ingredients except for the way of Tomato used. In Shahi paneer masala, the recipe calls for the finely chopped ones and pureed form for the paneer butter masala. For the healthier version, I had replaced Paneer with Tofu but trust me, the masala blended so well with tofu which reduced the flavor of soya. I followed the same procedure as given in the pack and it took exactly the same time it took for Shahi paneer ( 20- 30 minutes ). The gravy tasted delicious and luscious, when I served it with Roti and Rice. No compromise in the texture of the gravy, it looked creamy because of the addition of milk powder. The spice level was perfect and tantalizing. The flavor and aroma reminded me the regular Paneer butter masala. Personally, added little extra salt according to our taste bud. On the whole, this masala was a huge hit among my family members too. My Rating : 4 1/2 on 5 ! The dish was delectable and must try. Thanks Eastern Condiments for giving me an opportunity to review your products. Free from hydrogenated fat, No artificial colors and flavors gives a confidence to try this products. This is an excellent product for working ladies and Bachelors. And, also an excellent option to serve an exotic North Indian cuisine in a short time, using less ingredients for a sudden guests.